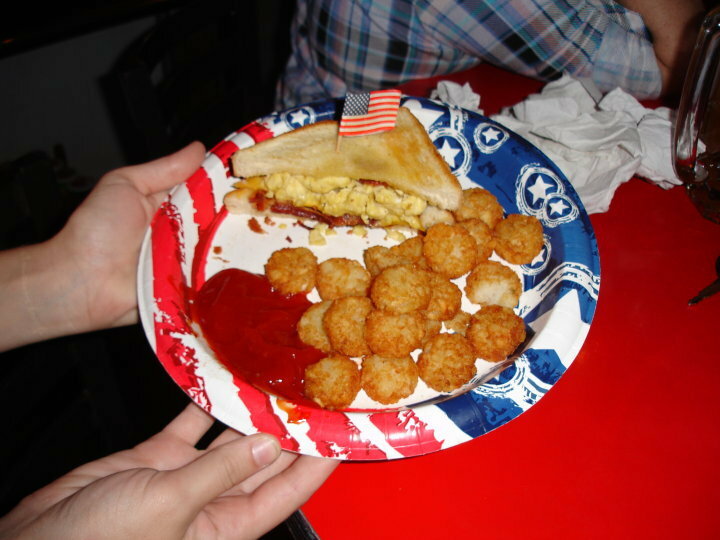 Plucker's Wing Factory and Grill hosted one of the best World Cup parties in Baton Rouge for the USA vs England match. I know this because I was there. And I lived through it. Barely. 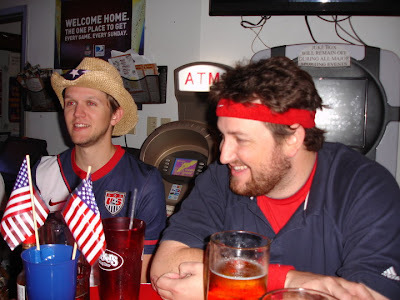 Saturday, June 12, 2010 began at 5:30 am when I woke up, but on my spirited garb, and left the house to pick up Justin, a fellow soccer hooligan for the day. We arrived at Plucker's at 6:30 am, just in time for the doors to open and to catch the kickoff of the first game of the day, South Korea vs. Greece. Dustin waited for our arrival in the parking lot and as we entered we noticed that weren't the first people through the doors. Impressed by the people the beat us, we claimed a couple tables by the bar, ordered beers and bloody marys, and began our consumption. It didn't take long for Brent, Eric, Kyle, and Erryca to arrive, and after that we knew we were in for a long, glorious day. Plucker's fortunately had breakfast sandwiches for us to prime our stomachs. That might have been a life-saver. 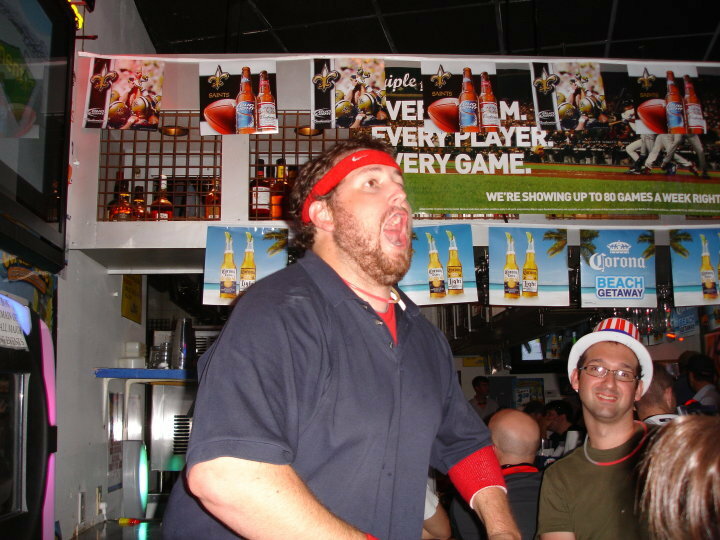 By the time the South Korea defeated Greece 2-0, we had already started playing Captain Dickhead with 34 oz beers. Oops. 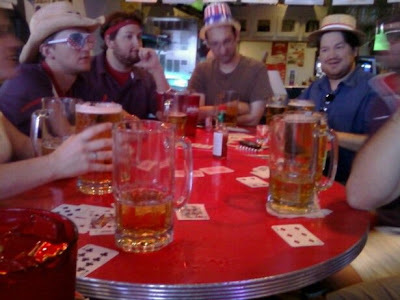 During the break after the second match which saw Argentina defeat Nigeria 1-0, Plucker's began to rapidly fill up. 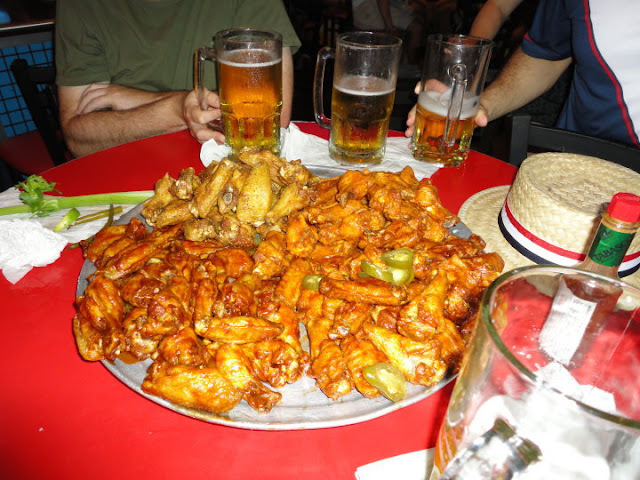 Some us got hungry and ordered some wings. And by some, I mean 100. They were damn tasty. Then the main event started. USA vs. England. FIFA World Cup 2010. The time had come. Now, I present the fan reaction of the USA goal at Plucker's Wing Bar in Baton Rouge, LA where I watched the match. See if you can spot me! Also, see if you can spot Eusebio doing a little dance! I recall at some point making "American" gestures with Eusebio and Brent across the bar. The Hulk Hogan theme music from WWE blared in the background, and apparently I climbed up on couple stools and started posing. Quite the patriot I am. While it may have felt a little odd for us Americans to be celebrating a tie, by all accounts it was a victorious day for both us and the American squad in South Africa. Geaux America! I can't wait for the rest of the World Cup!